Ghetto2Garden, Santo Domingo’s dog shelter made from recycled materials, has just become more sustainable by adding student-made solar power cubes to run the rehabilitation center with green energy. 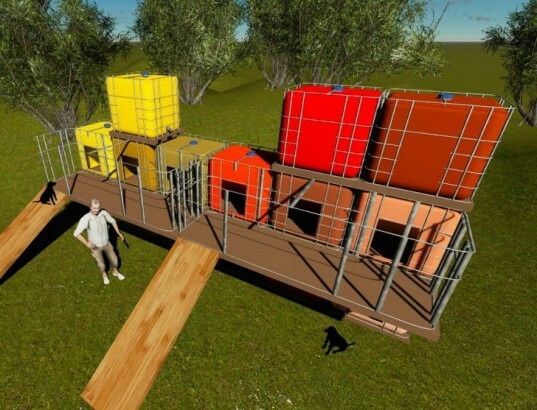 Students from the United States and the Dominican Republic were invited to transform liquid shipping cubes into working renewable energy systems this summer, helping local animals while also getting a lesson in green technology. Designed by Colectivo Revark and the Practivistas Domincana Program, the shelter provides a comfortable place for cats and dogs found on the streets of Santo Domingo. Ghetto2Garden had previously made a plea to the local community for materials to repurpose into comfortable kennels for the cats and dogs that were rescued. After tackling living quarters, the team turned their attention to power. Students from Humboldt State University and the Dominican University UNIBE were invited to put their sustainable muscle to use in an appropriate technology immersion program that culminated in several Solar Lighting Cubes. Each Solar Lighting Cube was constructed with donated and found materials, with the durable plastic base of a liquid shipping container encased in a metal grid and topped with a solar panel and control system. While the cube tops siphon the solar power, the spaces below were cut open to provide a cozy sleeping space for a rescued dog. The solar panel doubles as a roof, which shades the translucent plastic cube. The new solar power cubes not only give animals a place to comfortably rest their furry heads, but are also an easy to repair energy system that can steadily produce 200 watts each for this innovative animal shelter. Ghetto2Garden had previously made a plea to the local community for materials to repurpose into comfortable kennels for the cats and dogs that were rescued. After living quarters had started to be built, the team turned their attention to power. 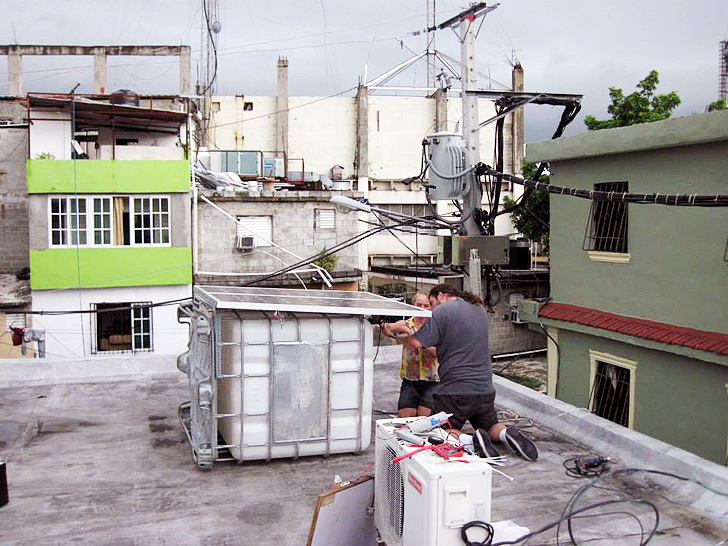 Students from Humboldt State University and the Dominican University UNIBE were invited to put their sustainable muscle to use in an appropriate technology immersion program that would build Solar Lighting Cubes from found and donated materials. Each Solar Lighting Cube constructed was made from donated and found materials, with the durable plastic base of a liquid shipping container, encased in a metal grid, and topped with a solar panel and control system. With the tops of the cubes siphon the solar power, the shipping cubes were cut open below to provide a cozy sleeping space for a rescued dog. The solar panel doubles as a roof, which shades the translucent plastic cube. The new solar power cubes not only give animals a place to comfortably rest their furry heads, but are also an easy to repair energy system that can steadily produce 200 watts each for the altruistic animal shelter.